Take on the roll of a top jeweler to sort though gems of all sizes and shapes in order to run your shop. Click here to play! If you can manage all of this expensive merchandise, you'll see yourself filling your pockets with enough cash to buy a few gems of your own! Of course, diamonds are the most in demand at your store. 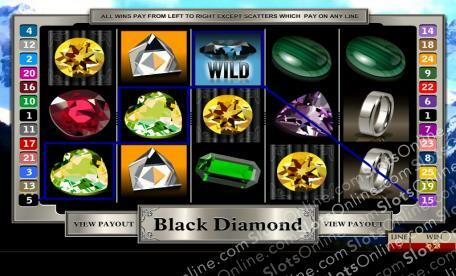 Watch out for these sparkling stones as they act as wild a symbol, which means that they will substitute for all other symbols excluding scatters and bonuses. This will help you create more winning combinations and bring in the green. The lovely yellow Citrine stones will also payout handsomely. Spin two to five of these on a pay line and you'll get 6000 times your bet. Garnets are next in line with five of these radiant red gems getting you 1000 times your bet. As you might expect, there are plenty gems displayed in your store's glass cases, including emeralds, amethysts, sapphires, jade and silver rings. You'll want to push the ruby apple as this sparkling gem acts as a scatter that could see you winning a number of free spins. But, even better than that try to spin the gold bars. These valued blocks will trigger a bonus game. Will you be able to sell all of your gems for a chance to bring in the big bucks? The gleaming red ruby apples act as scatters. Spin this symbols on reels 1 and 5 and you will be rewarded up to 25 free spins. Naturally, the diamond acts as a wild symbol. This sparkling stone will replace almost all other symbols to create more winning combinations. It will not replace scatters or bonus symbols. The gold bars act as a bonus symbol. If you spin these valuable symbols on reels 2, 3 and 4, you'll trigger a bonus feature that will reward you a number of bonus coins.